Kraig Koach practices in the areas of estate planning, probate and trust administration, real estate and corporate law. He received his undergraduate degree from the University of Florida, his law degree from Cumberland School of Law at Samford University, and his L.L.M. (Taxation) degree from the University of Miami. He was admitted to the Florida Bar in 1985. 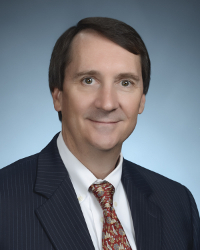 Mr. Koach has served as Director and President of the Kiwanis Club of Sarasota, and Secretary of the Kiwanis Foundation, He has served on the Executive Board of the Southwest Florida Council, Boy Scouts of America, and as Vice President of Membership. He has also served as Director and President of the Woman’s Exchange Inc. of Sarasota. Mr. Koach is presently serving as Vice Chairman of the Pines of Sarasota, Inc. He is acting Senior Warden of the Church of the Redeemer, and has recently been appointed to the Diocesan Council of the Episcopal Diocese of Southwest Florida.